What is 100 Santa Project? One person can bring a smile, 100 can bring a change/happiness. A thought that just felt like a fantasy ( far fetched dream) felt surreal when it slowly started moulding into a7 movement and a purpose that brought 100’s of us together to pull of a event of such a magnitude. 100 Santa’s Project – #BeASanta was a movement we started with a simple intention of bringing joy and spreading happiness amongst the street kids to whom this could be his first experience at Santa! It slowly grew into a small initiative where everyone from a college going graduate to a grandpa as old as 73 believed and supported our dream and joined us pull a event which helped distribute essentials and gifts to over 5,000 slum and street kids in and around the City. All of us want to do good , we want to give back and be a reason for someone’s happiness. All we need is a belief and a start. The world can be a better place to live at and the reason for it could be YOU. We started with 256 gifts 7 days before the event and grew to 5,000 gifts just cause we believed and were joined by individuals who believed and entrusted us with their support in whichever way viable. An initiative by Sounds of Silence to make this Christmas special for the underprivileged kids of our society. The warmth and joy one gets on opening a Christmas gift are boundless. Spreading the same smile on the street kids of Mumbai will undoubtedly bring you enormous delight. So 100 Santa Project just requires your wish and commitment to a noble cause. 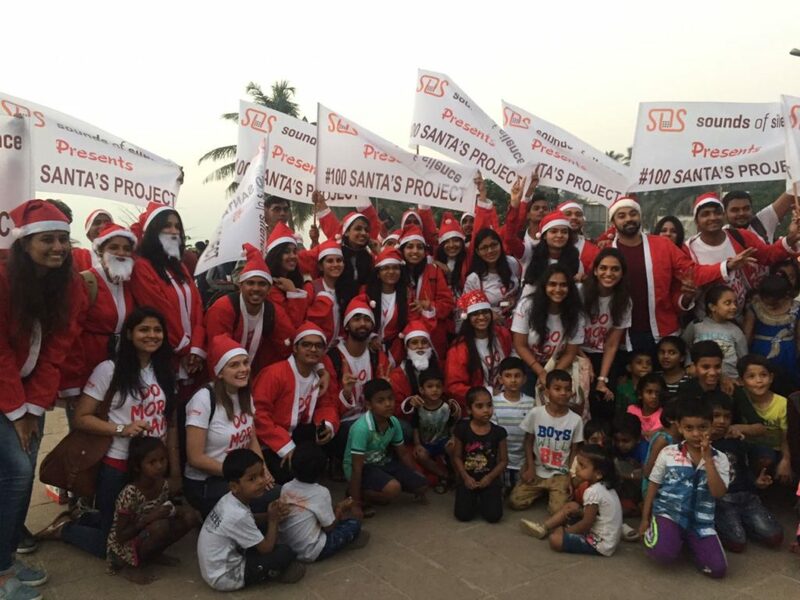 We at Sounds of Silence have taken up 100 Santa Project to distribute 10,000 gifts and goodies to street kids across Mumbai. If you wish to join us for this noble cause , please fill up the form and we’ll get back to you. As a part of this project, all the participants willing to become a Santa Claus have to congregate on 23rd December at 3 pm at Carter’s road Bandra. 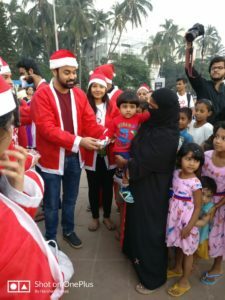 Thereafter, we would be assigning you specific areas where you will go around in your Santa Claus Costumes and distribute gifts across the streets and slums of Mumbai. Our volunteers will accompany you to the respective regions.